I heard a lot about the lobby of New York City’s Hotel Pennsylvania – specifically what happens during the Annual Westminster Kennel Club Dog Show every February when hundreds of pedigree pups are carted (or kenneled) into the hotel conveniently located across from Madison Square Gardens, home of the grand evening show ring and Best in Show moment. I heard about red carpets being rolled out (at dog breeders’ request), thirteen cheese burgers ordered to reward a potential Best in Breed winner (not 12, not 14), and even an opera singer hired to perform for an Italian breed of dog who the owner claimed had a preference for high culture and baritone. Besides, who really needs a reason to spend a weekend in NYC checking out show dogs, Times Square (never gets old), the new Whitney Museum of Art relocated in the West Village, and the largest dinosaur fossil ever found recently added (temporarily) to the American Museum of Natural History‘s collection? (Yes, site of the movie). NYC never disappoints, even during one of the coldest weekend in February, and sitting in a crowded lobby filled with almost as many dogs as people, I start to catch Westminster fever. But nothing crazy happens. Hotel Pennsylvania might not be the city’s sexiest but it has to be the most pet-friendly, especially during dog show weekend. The basement ballroom becomes doggie spa central – grooming tables, bathtubs, and treadmills are busy keeping contestants clean, beautiful and buff. And the most active dog relief zone where fake fire hydrants encourage … well, you get the picture. I was privy to spa insight thanks to doggie concierge Jerry Grymek. (The dog spa is only there during the WKC event, though the hotel is dog-friendly for all sizes year round). One week a year, Grymek transforms, like Superman from a phone booth, from Public Relations professional for LMA Communications based in Toronto to Pooch Relations extraordinaire for the Hotel Pennsylvania offering four-foot friends and entourage everything their hearts desire from frosted bone-shaped cookies at check-in to more than a dozen cheeseburgers after the sun sets (if requested). But mostly Grymek handles media requests as manager of ‘Pup Relations’ and escorting ‘puparazzi’ around the hotel that’s been a partner of the hugely popular Westminster Dog Show for decades. 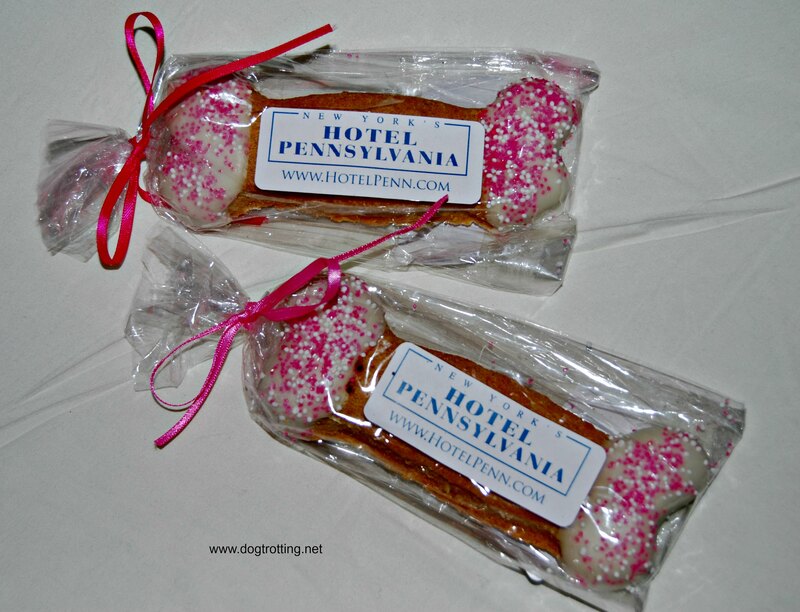 Not only is the Hotel Pennsylvania dog-friendly throughout the year – call to book a dog package that way they can put you in a pet room and make sure a doggie check-in gift is at the front desk – the hotel has history. Almost 140-year history like WKC. Almost. Built in 1919, Hotel Pennsylvania was once a Grand Dame of stately NYC hotels with 22 floors and 1700 rooms (now, there were more). This building is from an era when white-gloved women escorted by dapper fedora-wearing men headed out the front doors to the theatre blocks away. In the rooms, they likely walked on black and white bathroom tiles still there and turned the now decades-old door handles reminiscent of days before key cards. Today, there are key cards, 21st century elevators and good water pressure. The Hotel Pennsylvania is a nostalgic, clean, safe and economical accommodation in the centre of the an expensive city, two blocks from the Empire State Building, two blocks from Macy’s and a 20-minute walk from Times Square. This is bare-bones good value – no boutique hotel amenities here. Everything from baggage check and early check in to in-room Wi-Fi and the downstairs business centre costs extra. Paying the early check-in fee might be worth it because during big events, like the WKC dog show, lobby line-ups are long … hours long. However, with 1700 rooms, vacancy is likely and Pen Station across the street makes the hotel easy to get to. In 2006, the ‘Save the Hotel Pennsylvania Foundation (now the Preservation Society), saved this building from demolition – temporarily. That threat loomed until 2013 when current owner Varnado confirmed it would be eventually renovating the hotel rather than turning it into office space as originally planned. However, the building has never earned official historic landmark status. Highlights include – The Glen Miller Band played the ballroom repeatedly, and in 1925 William Faulkner wrote a novel here. Less illustriously, the first Star Trek convention was held here in 1972. I stayed on the 13th floor. I recommend it. There is a 13th floor. It’s also pet-friendly. Did I mention that? The closest dog-run is about five blocks away in Madison Square Park on Madison and West 23rd Street. Want to get around NYC? Make it easy on yourself with Frommer’s EasyGuide to New York City 2016. Available on Amazon. My family lives in New York City so this hotel will be a must-see on our next vacation. Bentley and Pierre are drooling over those awesome dog cookies! If you plan to spend more time away from the hotel than in it and are looking for good value, this is it. I was able to walk or cab (quickly) to most places I wanted to go. Glad there is a dog friendly hotel in NYC. However, that is one place that is not on my bucket list. I’m just a country girl and heart and prefer the great outdoors to a huge city. I love New York … But some were having challenges negotiating it with a dog. I also feel for the urban dogs who go for walks everyday on these streets. Makes me appreciate the river I live near. Love this post! I almost feel like I was there after reading about the vibe of the hotel and what it’s like during the WKC show. Sounds like so much fun…..combining NYC energy with show dogs and people and the Hotel Pennsylvania. Who could ask for anything more?! Thanks! It’s a strange vibe. People are annoyed the lobby is congested until they realize it’s caused by dogs.